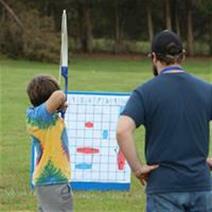 In our one-day introduction program, we will: introduce the sport of archery, learn range safety, learn basic shot technique,and play fun archery games. This program is intended to introduce interested children to the sport, as such, it focuses on safety and fun, but does not delve too deeply into advanced technique. The instructor for this program is USA Archery certified. All equipment will be provided, and the program will take place at Booster Park on February 23, 2019. Registration is due by February 8, 2019. Space is limited, and registration will close once the maximum number of participants is reached, even if before the deadline. Any registration received after Feb. 8 will be assessed a $10 late fee.